COLORADO SPRINGS, Colo. -- In the wake of President Barack Obama's space policy speech today, it's time for critics and supporters alike to take a deep breath and look at the new plan for NASA again, space experts said. The president spoke at Florida's Kennedy Space Center outlining his vision for the future of America's space program. It was the first time President Obama has directly addressed the topic since releasing details of the new plan along with his 2011 budget proposal. The plan has come under fire from some critics who objected to some details and lamented the cancellation of the existing plan, called Constellation. "The detractors of [the plan] were listening carefully and I think that at least it has caused them to think some more about where their positions are," said former Pennsylvania congressman Robert S. Walker, chairman of Wexler and Walker Public Policy Associates. Walker spoke here at the 26th National Space Symposium following President Obama's speech. But, he added, "I doubt that minds were changed today." Also speaking on the symposium panel, XM Radio co-founder Lon Levin, a member of the National Space Society Board of Governors, said President Obama may have affected some people's views of the new course for NASA. "He is a very eloquent man. He can present his case well. I think he did present his case well," Levin said. Walker agreed the speech went well. "He added some poetry to the overall mission," he said. "In politics that's always important." President Obama added some new details to the plan as already officially announced, including his decision to keep the Constellation project to develop the Orion crew capsule, originally intended to carry astronauts to low-Earth orbit atop the Ares I rocket. While Ares will no longer be built, President Obama has salvaged Orion to be used as a crew escape vehicle from the International Space Station. "I think the keeping of the Orion mission is a very interesting and rather clever move on the part of the administration," Walker said. He explained that this decision will enable work on elements of the new NASA vision to go forward, even if the 2011 NASA budget appropriation isn't agreed on soon. "This money had already been appropriated for the Constellation program," Levin said, agreeing, "It is a brilliant move." The president also clarified the timeline for the new course, giving NASA a deadline to decide on a plan for a heavy-lift rocket capable of carrying astronauts beyond low-Earth orbit to asteroids and Mars. "We will finalize a rocket design no later than 2015 and begin to build it," Obama said. Walker said having this timeframe is "a good step forward," though others have said that deadline is too far away. "We obviously would like to see something sooner," Jim Maser, president of rocket engine company Pratt & Whitney Rocketdyne, told SPACE.com. "We'd like to see an architecture defined sooner so we can better align our plans." 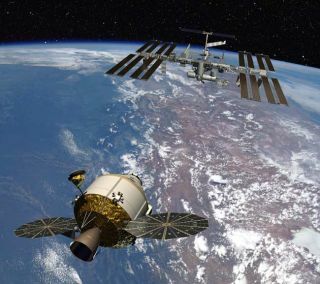 Those who could stand to gain most from the new plan are commercial companies that could reap the benefits of a new initiative to encourage the private sector to develop space transportation to low-Earth orbit. One company that plans to try is the Space Exploration Technologies Corporation (SpaceX). "I believe this address could be as important as President Kennedy's 1962 speech at Rice University," SpaceX founder and CEO Elon Musk said in a statement before the speech. "For the first time since Apollo, our country will have a plan for space exploration that inspires and excites all who look to the stars. Even more important, it will work." Yet others could lose from the new vision's cancellation of the Constellation program and President Obama's decision to go forward with the planned retirement of the space shuttles later this year. In particular, many jobs in Florida and other states with NASA centers could be lost after the shuttles are grounded. President Obama announced a program to provide transition training to people on Florida's Space Coast who stand to loose their jobs. He also said the new program will ultimately create more jobs than the Constellation plan. "He explained very specifically what he believes that this new program will result in with regards to jobs," Levin said. "He hit it on the head, one of the critical aspects." The transition funding "is critical," Maser said. In fact, Levin predicted other regions will likely clamor for similar transition funding programs.